What is a fossil? Simply put, a fossil is the remains or evidence of any creature or plant that once lived on the Earth. There it is simple, straightforward, and hopefully clear. It is the short form answer. No frills. Stay with us though because some explanation is in order. Now let's look at the long answer. Type I-the remains of the dead animal or plant or the imprint left from the remains. impression of an animal or plant, even if the actual parts are missing. The bones of this ichthyosaur are a type I Fossil. So now you have one short and one long answer to the question: "What is a Fossil?" Let's build on that. Type II- Something that was made by the animal while it was living that has hardened into stone. These are called trace fossils. 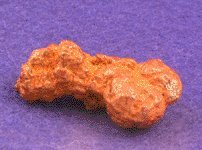 This coprolite is a type II Fossil. 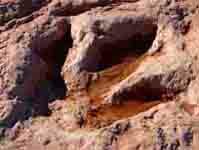 Here is a dinosaur footprint also a type II fossil. 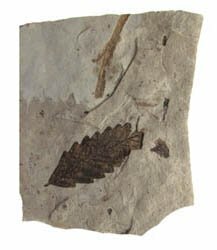 Type I fossils can be the actual thing that it once was, like a piece of bone or hair or feather. More often the bone material is replaced by different minerals contained in the liquid of the sediments that buried it. What was once bone is now some sort of crystal. This process also takes place with shells, exoskeletons and wood. If the spaces in the bone are filled with liquid minerals which later harden it is called permineralization. Sometimes the organic material is dissolved by the mineral-laden water. The process happens so slowly that each cell is dissolved and replaced by a particular liquid mineral before it hardens. This is called petrification. In petrification, every detail down to the cellular level is duplicated in the minerals. Type I can also be molds or casts of the original animal or plant part. If the original organism decays, leaving an imprint and an empty space, it is called an exterior mold or simply a mold. If a space in the structure is filled with minerals and then the original animal or plant part dissolves, it is called a cast. 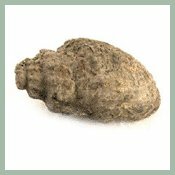 This gastropod is a cast fossil. The question: "What is a fossil?" has a simple answer. But as you can see it can be more complicated than that. Now that you know what fossils are learn about how they form.